Home » Countries » Popular Articles » Malta Diary – The three-legged horse! Malta Diary – The three-legged horse! With €90 million the cost to-date as anticipated against the original budget of €80 million, a further €10 million projected to overshoot, a project which commenced in 2008 and was targeted for completion by 2012 continues to struggle on amidst bitter controversy and will not be completed by end 2014. And of course, as with all such bureaucratic struggles, you cannot actually pinpoint who is to blame. Contractors blame each other and blame their sub-contractors; the architects blame the engineers; the planners and the Opposition blame the Government, the Government blames the Opposition when they were in Government between 2008 and 2012 and the carousel goes on and on and on. Aftermath legal wrangling in Court is anticipated to later take us well into the second decade of this Millennium and standing aloof of all this hubble-bubble, a statue of a three-legged horse looks on proceedings with detachment and disdain. When the celebrated Italian architect Renzo Piano launched his blueprint of a new City Gate for the entrance to the capital city Valletta he kindled a controversial bonfire of conflicts, the only point of agreement being that no matter the pros and cons of his plans, anything would be better than the disgusting structure that straddled the city’s entrance after the grand old gate was torn down and replaced by a monstrosity over 40 years ago. The Government clearly wanted the project to commemorate its lengthy administrative tenure. The Opposition labelled it a waste of money. The electorate was sharply divided with opinion polls ranging from it being “a monstrosity replacing another monstrosity” at one end of the scale to “sheer brilliance” at the other extreme end. The project envisaged a new majestic entrance, a grand and sweeping staircase on the left, a new Parliament on the right for the House of Representatives with ample offices for all representatives and clerical staff, a partial renovation of the old bombed theatre and conversion into an open-air theatre and a new plaza behind the theatre to be created by tearing down some old buildings and creating a generous space in an otherwise vastly crowded city. Well, the staircase has been completed; the plaza has been completed, the renovated theatre is well-advanced but the Parliament building, the main source of sharply divided opinion, struggles on and has once more rekindled the fires of controversy afresh. As if there wasn’t already enough conflict to be getting on with, new contentions fanned the flames. A plinth with the statues of four Knight Grandmasters was projected for the plaza centre but the Planning Authority responsible for environmental matters was having none of it, citing it to be “inappropriate”. Negotiations on this are ongoing but temporarily a statue of Grandmaster Jean Parisot de la Valette has been plonked there to fill the space. However, la Valette’s statue has its place at the grand entrance at the bottom of the new staircase, appropriately enough because he was after all the founder of the city which bears his name, and will later be transferred there. To temporarily fill the space awaiting la Valette at the entrance there is now an impressive four-metre black marble statue of a three-legged horse, the work of sculptor Austin Camilleri who pronounced its incompleteness by also giving it the incomplete name of “zieme” omitting the letter “l” at the end which would make the complete name “ziemel”, the Maltese word for horse. Whilst Camilleri has his own explanations for this, the public is not so sure. Some claimed he had run out of material; others said it denotes the lameness of the whole project; one wag claimed it symbolises the country’s general administrative lameness and a million and one other reasons. The sculptor announced his three-legged horse symbolises “lost power”. Before Independence in 1964, Malta had been under colonial powers for five thousand years. Malta abounds with statues of its colonisers. 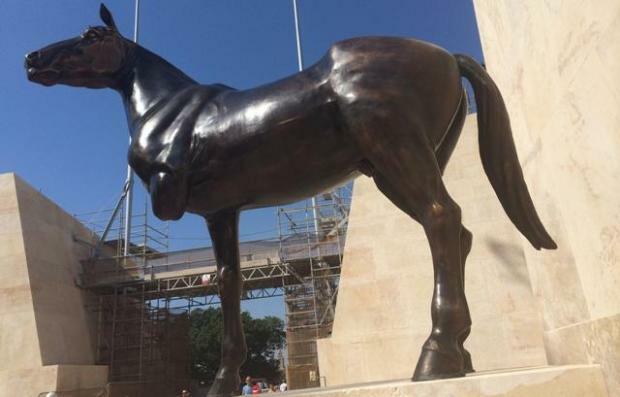 Some of these are mounted on majestic horses to symbolise their power – yet there was not one single statue of a Maltese personality mounted on a horse because prior to 1964, the Maltese had no control and no power. Another sane explanation interpreted the statue to symbolise spiritual and physical shortcomings in that imperfection should be accepted by society because nobody is perfect, yet despite the imperfections we are all equal and need community support. Whatever, the spectacle of the three-legged horse at Valletta’s entrance certainly makes people stop and stare and tourists in particular jabber away in their speculations of what it might mean. Time will tell where the “zieme” with the missing leg and “l” will finally be padocked when Grandmaster la Valette takes his rightful place and the whole project inaugurated with no doubt much ceremony and celebration. Yet, there is more controversy in the offing. Malta’s main bus terminus is stationed just outside the city, revolving round the Triton Fountain which was designed and built by one Dom Mintoff, former Prime Minister and an accomplished architect by profession. Some are clamouring for the fountain and terminus to be removed and relocated as they are alleged to be eyesores compared to the new entrance. Yet, to where in an area where space availability is nil? Above all, the late Dom Mintoff had and still has many thousands of ardent followers and they will undoubtedly take umbrage if any attempt is made to relocate the fountain. Pleasures yet to come!